Some rules for appropriate use of the University's information technology resources derive from legal considerations. For example, the University must ensure that its non-profit status is not compromised by inappropriate political campaign or commercial activity. The University must also address actions that may violate its agreements with outside vendors. Additionally, these rules are intended to ensure that University resources and spaces are used to advance the University’s mission of teaching and research, while enhancing and embracing its diverse community. The University is a "carrier" of information via electronic channels rather than a "publisher" and hence, except with regard to official University publications, not expected to be aware of, or responsible for, materials or communications that individuals may post, send, or publish via the World Wide Web, Internet discussion groups, Facebook, YouTube, Instagram, or any social networks; or make available via any file-sharing method; or send via e-mail, tweeting, instant messaging or video; or any actions taken by individuals’ avatars within online virtual reality or gaming environments. However, under certain circumstances, the University may be required to respond to complaints regarding the nature or substance of such materials or communications. The examples presented in these guidelines focus on matters related to information technology, but derive their broader meaning and significance from the basic rights, rules, and responsibilities that apply to all aspects of the University community. The examples are illustrative, not exhaustive. If something is not specified as inappropriate, it still may violate the principles set forth in Rights, Rules, Responsibilities and be subject to University sanction. It is important to use common sense and critical thinking in evaluating new situations. Because technology changes so rapidly, and the human imagination is boundless in exploring what technology can do, the Appropriate Use policy will continue to evolve. In addition, the University's Rights and Rules Committee and the Council for the Princeton University Community (CPUC) are charged with the task of revising Rights, Rules, Responsibilities, and any changes made to RRR could affect the language of the Appropriate Use Policy and these guidelines. In general, as stated in Rights, Rules, Responsibilities, the University normally does not impose penalties for misconduct off-campus beyond the local vicinity. However, electronic misconduct directed by a member of the Princeton University community against another member or members of the Princeton community may be actionable regardless of the location from which the misconduct originated or the network or devices used. Consistent with RRR, judgments about such incidents will depend on the facts of an individual case. All faculty, students, staff, departmental computer users, authorized visitors, and others who may be granted use of the University’s systems and network services or University-contracted services, must comply with the University’s policies. When a member of the University community is found to be in violation of this policy, disciplinary action is handled by the normal University authority and via the normal disciplinary process that would apply for other types of infractions. When an authorized visitor or departmental computing-account user is in violation of the policy, the University sponsor or host may be held accountable. If the matter involves illegal action, law enforcement agencies may become involved, as they would for campus actions that do not involve information technologies or the Internet. As a member of the University community, you are provided with scholarly and/or work-related tools, including (but not confined to) access to the Library and its systems, to certain computer systems, servers, software, printers, services, databases, and electronic publications; to the campus telephone and unified messaging systems; and to the Internet. Your use of all information technology should be for purposes that are consistent with the non-profit educational mission and the policies of the University, and should comply with any applicable license agreement and terms of service. Members of the University community are prohibited from using University information technology and digital resources for commercial purposes. Computing and network equipment and mobile devices purchased by the University remain the property of the University even if they are dedicated for your use. Equipment purchased under research or other grants normally is vested with the University, though it is to be used for the purposes of the grant. When University-owned equipment no longer is needed, its disposition must comply with University policy, including the Information Security Policy, and may not be determined independently by the user of the equipment. Those purchasing networked devices using University funds or credit cards must follow normal University purchasing procedures, as for all other University purchases. Tampering with University-owned IT equipment, including cell or smart phones, is defined as making unauthorized changes to the hardware or system-level software that may be in conflict with licensing agreements or may void applicable warranties. University employees must not perform or condone such actions. Exceptions sometimes may be made for purposes of academic research. Personal use of the University’s IT and digital resources, except for students enrolled at the University, should be incidental and kept to a minimum. For example, use of such resources by an employee for non-work-related matters should be reasonable and limited so that it does not prevent the employee from attending to and completing work effectively and efficiently, does not incur additional cost to the University, and does not preclude others with work-related needs from using the resources, including the shared campus and Internet bandwidth. Individual departments or units may place additional restrictions on personal use of the resources by their employees. If you develop or acquire information technology and/or digital hardware, software, or systems for the University for use by students, faculty, staff, or the public, you are strongly encouraged to make efforts to ensure that the result will be accessible to all individuals, including those with disabilities. If a service or system is not accessible at the time of acquisition, you are strongly encouraged to work with the vendor to ensure that accessibility enhancements will be provided over time. Offices seeking information, assistance and/or training regarding digital accessibility should consult the User Experience Office. All information stored on or transmitted through the University’s electronic services, equipment and systems, including but not limited to servers, computers, mobile devices, telephone systems and cloud-hosted storage (collectively, “IT Systems”) is subject to the rules of Princeton University, including the Policy on Access to Accounts and Information. The University has the legal right to access, preserve and review all information stored on or transmitted through its IT Systems. Non-intrusive monitoring of campus network traffic occurs routinely, to assure acceptable performance and to identify and resolve problems. If problem traffic patterns suggest that system or network security, integrity, or performance has been compromised, networking and monitoring systems staff will investigate and protective restrictions may be applied until the condition has been rectified. By attaching privately owned personal computers or other information technology resources to the University’s network, users consent to University use of scanning programs for security purposes on those resources while attached to the network. Some departments that maintain servers or internal networks may collect usage data and may monitor such servers or networks to ensure adequate technical performance. Departments that collect such data are expected to protect the privacy of those using the resources. The University also provides some access to files and documents residing on University-owned equipment and systems (and/or transmitted via the University’s network services) to outside vendors who have been contracted to provide technology services. The University’s contracts with such vendors contain firm provisions for security of information and for the privacy of members of the University community who may use those services. To comply with (a) federal, state, or local law or rules; and/or (b) validly issued subpoenas, governmental information requests, warrants, court orders, or discovery obligations in a pending or reasonably anticipated legal proceeding, the University may be required to access, preserve, review and/or produce information stored on or transmitted through its IT Systems, the University may be required to access, preserve, review and/or produce information stored on or transmitted through its IT Systems. Similarly, the University may be obligated to disclose the identity of an account-holder or identity of the person who owns a computer or other registered network device, is responsible for a University-owned computer or networked device, or holds a University-assigned account used in some electronic transaction. Contact the Office of the General Counsel prior to disclosing any information in response to any subpoenas, court orders or other information requests from litigants or government agencies. When the Office of the General Counsel issues a “Legal Hold Notice,” individuals to whom the notice is directed must suspend regular document retention practices and retain the information described in the notice until further notice from the Office of the General Counsel, including after an employee’s departure from the University. On preparation for employee termination, supervisors are expected to assure that passwords to computers, other networked devices, and accounts are obtained and changed if the work of the unit requires access to data or resources previously managed by the employee, and that copies of critical work product remain available following the employee’s separation from the University. If you are a supervisor who has access to an employee’s files or e-mail, or have been designated by a supervisor to access another employee’s files or e-mail, you should be careful to avoid reading personal items that may be stored in the same area. For example, upon learning that an e-mail or voice mail message is personal, the supervisor or designee should immediately exit the file or message. The supervisor or designee should be careful to avoid examining any personal information the University may provide to the employee via password access, such as benefits or payroll data. When an employee leaves the University, the employee normally should be given the opportunity to remove any personal files or e-mail from University computers and other University-owned networked devices before departure. Departing employees are not entitled to remove, destroy or copy any of the business-related documents entrusted to their care or created by them during their employment, unless otherwise permitted by the University. The University’s Record Retention Policy also must be observed (subject to any Legal Hold Notice issued by the Office of the General Counsel). See University Records Management at www.princeton.edu/records. When the Office of the General Counsel has issued a “Legal Hold Notice,” individuals may be required to suspend regular retention practices and to retain information until further notice from the Office of the General Counsel, including after an employee’s departure from the University. Supervisors are encouraged to communicate the University’s expectations regarding privacy of employee files and e-mail, and periodically to remind employees of these expectations. Supervisors also are expected to take prompt action to retrieve or preserve employee files needed to continue the work of the department when an employee is about to separate from the University. From time to time, members of the university community, including students, may use electronic means to collect data of interest to projects or activities that serve a co-curricular purpose that is not related to official University business or required academic work – for instance, web-based surveys of other students’ opinions or experiences, or electronic usage data generated through engagement with student-created, web-based applications. · Provide potential users with a summary of how their data will be collected and maintained. · Obtain informed consent concurrent with the user’s submission of a netid and password. Once disclosed, this confidential data is also subject to the requirements described under “Protecting Data,” below. At no time should the data collected through these means be disclosed in ways that could directly or indirectly identify individuals, and the collectors of this data should take care to protect this confidential information from any unintentional disclosure by adopting all recommended security measures as well as an appropriate plan for data retention and disposal. Faculty and staff, including those who are designated as regular, term, visiting, and temporary, as well as student employees are responsible for retaining information that is of value to the University, whether for business processes, legal purposes, or historical value. The University’s Record Retention Policy offers recommended retention periods for common University paper or electronic records. Employees with questions should contact the University Records Manager. Members of the University community, especially employees, should understand that electronic information is governed by the same laws and regulations as paper documents, including statutes protecting the privacy of student records, medical information, and other kinds of personal information. Employees and students are expected to apply to electronic information the same security and record retention practices as those applied to paper documents. There are three ways of preserving e-mail: on the e-mail system, within an office’s paper files, or in some form of electronic record-keeping system, for example, OnBase. As a general rule, the longer the message must be maintained or the more it needs to be shared, the greater the need to remove it from the e-mail system and store it as a hard copy (including the metadata accompanying the message, for example, file properties or full e-mail headers) or in an electronic storage system. Attachments must also be identified and linked to the original message so that they may be easily located. In all cases, the authenticity and integrity of the entire e-mail message should be preserved. E-mail retained in electronic format must be migrated by the account-holder to new software and storage media as upgrades occur. Like all records, many e-mail messages eventually will cease to be useful to or needed by the department, and at that point should be deleted by the account-holder. Then the account-holder is responsible for assuring that the “Trash” or “Deleted Items” folder is emptied (either manually or on an automated schedule) to properly dispose of the e-mail records. When a University employee trades in or replaces a computer or other networked device, the employee or the employee’s computing support specialist must use appropriate, effective software to remove any and all data from the hard drive, or if warranted, destroy the hard drive by means approved by the University. As with the disposition of any other University records, e-mail disposal should be regularized and documented. With respect to back-up media, that these storage devices should be physically destroyed through approved University channels when no longer needed. However, it is imperative that copies of critical work and work product be maintained until no longer needed. All discarding of media containing Princeton University information must comply with the Information Security Policy. All members of the University community with ready access to e-mail are responsible for knowing the content of official correspondence sent to their University-provided e-mail address. Students who submit academic work via e-mail should retain copies of the work until certain that the instructor has received a legible copy. Acknowledgement by the instructor of receipt of a legible copy would be courteous and is encouraged. Faculty, staff and students who have personal e-mail accounts with services outside the University should use only their University-provided e-mail accounts for communications regarding University matters. Using University e-mail protects the privacy and security of University data; allows for verification of sending and receiving critical correspondence regarding academic and other matters; and facilitates responses to subpoenas and other situations that may require the retrieval, inspection, or production of documents including e-mail. University account-holders who have their e-mail copied or forwarded to an outside account must take care to avoid marking for their outside e-mail provider any such copied or forwarded mail as spam. Major Internet service providers have barred all e-mail coming from the Princeton domain when the provider's customers have marked as spam what the provider perceives to be too many messages. Such incidents can interfere with University business, as well as impede communication for other members of the University community. If you are responsible for data that are important to the University and that are created or stored on portable devices, you also are responsible for ensuring that the information is backed up regularly in a form that permits ready retrieval. If you are a student and have information needed for completion of your University academics, you are responsible for assuring that adequate and appropriate backup of the information is maintained. Some kinds of information are considered restricted and/or confidential. Some information is protected by law, for example, by FERPA or HIPAA. Some contractual agreements require protection of related information. Some research data, including data involving human subjects, must be kept confidential. In general, information should be protected consistent with the University’s Information Security Policy (http://www.princeton.edu/oit/it-policies/it-security-policy/). As an employee or student, whether you have authorized or inadvertent access to what the University defines as restricted or confidential data, you must comply with the University's Information Security Policy and know which University office has authority over the information. You also must confine your access to or viewing of such data to situations in which only your University responsibilities require such access or viewing. Any handling of confidential data, whether in hard-copy, on University-owned equipment, or via personally-owned home devices, should be done in the most secure, confidential manner, consistent with the Information Security Policy. In the event of unauthorized access to University data, whether through theft or loss of portable devices such as USB drives, laptops, smart phones or other devices, or any other security breach, the individual who possessed the device or learns of the breach is responsible for notifying the appropriate University offices of a potential data breach, and assisting with the University’s data breach response. If the individual suspects the breach involves illegal action by a member of the University community, the University's “Policy on Reporting Potentially Illegal Activity” (www.princeton.edu/reportingillegalactivity) should be followed. OIT's Help line (609-258-HELP by telephone, or helpdesk@princeton.edu via e-mail) is the best place to start when reporting potential data breach. If a related device is lost or stolen, a report should be filed as soon as possible with appropriate law enforcement. If the incident occurred off-campus, even outside the U.S., a copy of the relevant police report also should be provided to the Department of Public Safety. Restricted or confidential data ordinarily should not be stored on mobile devices that are easy to carry away. If it is absolutely necessary to do so, the information must be encrypted to protect it from view should the device fall into unauthorized hands. The portable device and, ideally the files as well, must be password-protected. It also is essential to provide adequate physical security for any device, including a desktop machine that contains confidential data. If personal information from children under the age of 13 is collected for commercial purposes, such activities may be subject to the Children’s Online Privacy Protection Act. The University recommends use of encryption whenever possible and legal. Encryption software is bundled with the operating system of most computers. Information regarding encryption on University devices is published at https://princeton.service-now.com/snap/?id=kb_article&sys_id=452a27064f9ca20018ddd48e5210c70f. Storage services in “the cloud” provide a useful alternative for those who use portable network devices or have computers stationary in several locations. The University has arrangements with certain providers for some secure cloud-based services. For example, there are Princeton-branded Google Drive accounts, which are subject to the Google Apps for Princeton University Usage Guidelines. (Undergraduate students have access to Princeton-branded Google Apps, which are subject to the Princeton and Google Terms of Service.) Until the University can endorse your doing so, storing confidential or private University information in other “cloud” services poses serious risks, and should be avoided. Peer-to-peer file-sharing software may not be installed or used on DeSC computers (the set of machines designated explicitly for administrative applications) because such applications could expose to Internet access information that is restricted, confidential, or University-private. Other policies affecting DeSC computers may be seen at www.princeton.edu/descpolicy and at www.princeton.edu/descsecurity. You are responsible for knowing the regulations and policies of the University that apply to your use of University technologies and resources. You are responsible for exercising good judgment in use of the University's technological, digital and information resources. As a representative of the Princeton University community, you are expected to respect the University's good name in your electronic dealings with those within and outside the University. Those who participate in social media as representatives or agents of the University should consult the Office of Communications’ social media policies (socialmedia.princeton.edu/guidelines) for guidance. As stated in RRR, "No individual or organization of the University may use Princeton University’s name, seal, logos, restricted images, or other identifiers (“marks”), or any marks that suggest Princeton University or any other Princeton University organization, except to the extent such individual or organization has been authorized by the proper University authorities or as permitted under trademark law." Deliberate misuse of the University’s name or other marks by any member of the University community will be regarded as a serious offense. Information in Princeton University's online campus directory is provided solely for use by members of the Princeton University community and by others who wish to reach a specific individual or resource at the University. Use of the information for solicitation by mail, e-mail, telephone, or other means, or for creation of a database for such use or for other purposes, is prohibited. Any member of the University community who misuses the data in such a way may be subject to disciplinary action. The privilege of using University equipment, wiring, wireless access, computer and network systems and servers, broadcast media, and access to global communications and information resources is provided to members of the University community and may not be transferred or extended by members of the campus community to people or groups outside the University without authorization. This includes providing network service to others through your own University network connection. Network service to residential units leased by the University may be extended to sublessors only when University Housing has approved the sublease. Actions that make the campus intimidating, threatening, demeaning, or hostile for another person are considered serious offenses by the University. Contemporary technology makes it possible for mistakes to be made more rapidly, and spread more widely, than ever before. When you compose, send, or redistribute electronic mail or leave voice messages; when you create or publish postings to World Wide Web pages (including images, message boards, social network sites, Twitter, or chat rooms), or mailing lists; or produce and submit for campus or general broadcast video materials, consider whether you would make those statements face to face with the person or people who may access your material. The same principles pertain regarding people or groups you may address outside the Princeton University community as to those within. As stated in Rights, Rules, Responsibilities: "Respect for the rights, privileges, and sensibilities of each other is essential in preserving the spirit of community at Princeton. Actions, which make the atmosphere intimidating, threatening, or hostile to individuals are therefore regarded as serious offenses. Abusive or harassing behavior, verbal or physical, which demeans, intimidates, threatens, or injures another because of personal characteristics or beliefs or their expression is subject to University disciplinary sanctions...."
University IT and digital resources may not be used to transmit malicious, harassing, or defamatory content. You must be sensitive to the public nature of shared facilities, and take care not to display on workstations in such locations inappropriate images, sounds, or messages which could create an atmosphere of menace or harassment for others. You also must refrain from transmitting to others in any location inappropriate images, sounds or messages that are clearly threatening, hostile, or harassing in contradiction to the code of civility defined in RRR. Use of anonymity or pseudonymity in any form of electronic or digital communication for fraudulent purposes or accomplished with the intent to harass another, misrepresent oneself as another, or any other behavior in conflict with RRR, will be considered a serious transgression. Technology has enabled ready and convenient use of recording instruments in ways not previously possible. Even unoccupied aerial vehicles allow access to areas once difficult or impossible to reach. Stand-alone or remotely-controlled cameras and other recording devices should not be used in places or ways that violate a reasonable expectation of privacy on the part of those whose activities are intentionally or accidentally recorded. Locker rooms, restrooms, personal residences, or dormitory rooms are some of the places where persons reasonably have an expectation of privacy, and in which adequate notice and consent of the subject(s) should precede the use of any photographic or sound-recording device. Capture or dissemination of images and sounds in such situations without such notice and consent of the subject(s) is disrespectful of their rights and may violate University policy or the law. Departmental use of cameras or other recording devices on the campus, whether stand-alone or remotely-operated, is subject to the approval of the Security Advisory Group (SAG), by contacting the Department of Public Safety. Members of the University community are prohibited from using University information technology and digital resources for commercial purposes. Campus-based organizations claiming national or regional status must use non-University IT or digital resources, including Internet access, for non-University activities. University departments and groups that are authorized to conduct certain kinds of commerce and who take credit card information over the campus network or Internet must comply with the University policy on accepting and handling credit and debit card payments, and other standards related to e-commerce. Electronic mail or World Wide Web, message board, social media, or Twitter solicitation using the University’s resources for fundraising unauthorized by the University, even when conducted on behalf of non-profit organizations, is prohibited. If you link to a commercial site from your Princeton University personal web page, you must take care not to do so in a manner that suggests the commercial site has the endorsement or support of the University. In some instances, a disclaimer of affiliation or endorsement may be advisable. If you maintain an outside website (.org, .net, .com, or other) that you wish to redirect to a Princeton University web page, you must do so in a manner that will not suggest the University sponsors, endorses, or otherwise supports the outside site. The University has contractual arrangements for those preferring outside hosting of departmental websites. If a different outside contractor maintains a website that you want to appear to be a Princeton University website, you typically will be required to obtain approval from the Office of the General Counsel. If you maintain an outside website, other than through the University’s contractual arrangements, that you want to present or otherwise identify as a Princeton University website or affiliate, special authorization is needed. This often requires review by the Office of the General Counsel. The same is true if you want to create a website internal to Princeton that is intended to represent an outside group or activity unaffiliated with the University. In this latter case, the group or sponsoring organization also must agree. Members of the University community, as individuals have the right to exercise their full freedom of expression and association. However, as a 501(c)(3) organization, the University is prohibited from participating or intervening in any political campaign on behalf of or in opposition to a candidate for public office and no substantial part of the University’s activities may be directed to influencing legislation (i.e., lobbying). A website is a form of communication. If something were to be posted on the University’s website that favored or opposed a candidate for public office or a partisan political organization or solicited financial or other support for a candidate or a partisan political organization, it likely would constitute prohibited political activity. It is the same as if the University distributed printed material or made oral statements or broadcasts that favored or opposed a candidate or a partisan political organization. In addition, the University’s website may not be used to influence legislation without approval of the Office of Government Affairs (OGA). Similarly, individuals may not use the technological resources of the University for political purposes in a manner that suggests the University itself is participating in campaign or political activity, or influencing legislation. Faculty and staff also should refrain from use of University e-mail for campaign or partisan political activity or influencing legislation without OGA approval. Unless otherwise provided in RRR Section 1.5 or other University policy, University resources typically may not be used for political activity. To the extent use is permitted, however, individuals and groups should take care to make it clear that when expressing political views they are speaking only for themselves and not for the University. Non-partisan educational activity is typically acceptable. Questions regarding the use of University resources with respect to political activity may be directed to the Office of the General Counsel. If, because of your status as a member of the University’s student body, faculty or staff, whether active or on leave, or as an affiliate, departmental computer user, or authorized visitor, or as the representative of an authorized University group, the University has provided you with an account that provides access to the University’s systems, networks, voice mail services or other technological facilities, you are accountable to the University for all actions that are performed by anyone who uses that account. Therefore, you are expected to take reasonable measures to prevent your accounts from being used by others. Passwords are a primary method of protecting University systems against unauthorized use, therefore you, as a University-provided account holder, are expected to change any pre-assigned default password at the first possible opportunity, to select strong passwords that are difficult to guess, and to safeguard them from casual observation or capture. Thereafter, any password for a University-provided account that might have been exposed to capture must be changed at once, and to something different enough from the original to provide the necessary security. Intentional sharing of passwords with associates, friends, or family is prohibited, unless required by the terms of University employment or the nature of the group to which the account has been assigned. If there are alternate and practical ways to share work-related information readily and securely, these should be used rather than one University employee’s being given the password of another. The University now also protects certain services and resources via multi-factor authentication. Eventually, all University-provisioned accounts will be registered for such authentication, requiring the account-holder(s) to register appropriate devices or carry a relevant token to be able to access the protected resources. Multi-factor authentication and strong account passwords also protect the account-holder against identity theft and against exploitive use of the account holder’s resources, access, and contact lists. A password used for access to a Princeton University account or resource should not be the same as those used to access non-University-affiliated resources. For example, account-holders should not use any of their University passwords as the password for a social media site, or a personal banking site, or other outside resources. Once used more widely at the University, at this time an enhanced security profile (ESP) is a method of protecting access to only a few University services and data. Nonetheless, you are expected to protect the answers to your ESP security questions as you would protect your password. There are Internet services designed to allow you to store personal information such as passwords, PIN numbers, credit card numbers, and other data for ready retrieval by smart phone or other mobile device. If you elect to store your University password(s) through such a service before the University recommends a secure option, you risk exposure and subsequent misuse of your University account access and files. If you administer a server or router or allow accounts or access for others, whether members of the University community or people outside Princeton University, on a networked device, system, server, router, or network address translator you own or control, you are responsible for protecting the University's property and good name from damage by others to whom you might provide access and for compliance by users with the University’s license agreements and any applicable terms of service. You also are responsible for assuring that no copyrighted material (including music, film or television, podcasts, computer games, and software) is published on, or distributed from, that system without permission of the copyright holder. If you cannot accept such responsibility, you ought not be providing access for others. You are responsible for assuring that a strong root or administrative password is in place; for installing and maintaining appropriate antivirus and firewall protections; for being aware of known vulnerabilities and for ensuring that the system you own or administer is not used by outsiders to relay commercial or other unsolicited mass e-mailings (i.e., spam); and, in general, for securing the system and its services against use by viruses, worms, or outsiders for attacks on other systems within, and outside, the Princeton University domain, or for other hostile or abusive purpose. If you are responsible for any web-based application presented through the University’s resources, you must ensure that it cannot be used by anyone to relay unsolicited e-mail or spam to others. You also must ensure that the application cannot be used by others to compromise the application itself or the server on which the application resides. You also must be aware of and apply security updates and security patches as they are released for the software used to create and maintain the application and/or website. Applications provided through cPanel or similar services on a University-maintained device will be scanned for vulnerabilities before being made operational, and any vulnerability should be addressed. If serious vulnerabilities in such an application are observed after initial implementation, the website will be suspended until the vulnerabilities have been remedied. Applications downloaded for mobile devices may also pose security risks and should be installed only when there is confidence they are secure. If you encounter or observe a gap in system or network security, you must report the gap to the appropriate office or authority, which may be the OIT Support and Operations Center, the Library Systems Office, or the appropriate system authority, either within or outside the University. You must refrain from exploiting any such gaps in security. The technological resources centrally administered by the Office of Information Technology (OIT) or University Libraries, and the distributed resources provided by individual academic and administrative departments of the University are intended to be used for educational purposes and to carry out the legitimate business of the University. Such resources include campus computer clusters managed centrally or by individual departments, the University's World Wide Web server, departmental Web and file servers, Blackboard course management system, access to research databases, local-area departmental networks, the campus broadband and optical fiber network and global and Intranet network access, the University telephone and voice mail systems, general University multi-user computer systems and servers, individual departmental systems and servers, SharePoint, Dormnet and access to the University's central and departmental e-mail service, and other shared campus facilities and services. Appropriate use of such resources includes instruction, independent study, authorized research, independent research, and the official work of the offices, departments, recognized student and campus organizations, and agencies of the University. All of these activities rely on reasonable performance from the component units and the connections that allow interchange among them, and on the security and integrity of the resources. For these reasons, and because there often are times when some resources are in shorter supply than can easily meet the demand, certain performance-related or sharing guidelines pertain. OIT and other University departments that operate and maintain computer and/or network systems and/or servers are expected to sustain an acceptable level of performance and must assure that frivolous, excessive, or inappropriate use of the resources does not degrade performance for the others who rely on such services. The practice of cryptocurrency mining is power intensive as well as appearing to be commercial in nature. Neither personal nor University equipment fed by University power sources may be used for such mining. Exceptions may be made for purposes of academic research. Devices that are badly configured or that have been compromised sometimes behave in ways that disrupt network service for others. In such cases, service to the device may be blocked, or the device may be marked ineligible for network access, until the responsible party can be contacted to take corrective action. Researchers and students with network experiments should not plan to use the University's production network services for their research without authorization, and should understand that disruption of normal network service will not be permitted. Users of shared resources should avoid making available via those resources items that are prone to uses that may degrade or otherwise compromise performance. If a research project requires very large amounts of a resource, the researcher may need to make special arrangements in advance of conducting the research. Many of the databases, electronic periodicals and other publications that the University offers through its libraries are subject to license agreements with outside vendors that restrict your use of these resources. For example, such licenses often limit the number of documents that you may scan or the number of pages you may print, and there may be restrictions on the types of use permitted. Violations of such restrictions can result in the termination of licenses and the loss of access to resources important to the University’s mission. Before using such licensed resources, you will be given notice of any relevant restrictions and are responsible for complying with them at all times. If no notice is provided, you are responsible for inquiring about the terms of appropriate use. There are national and international projects that rely on cooperation and collaboration of large numbers of computer systems to conduct research. You may not use your account on central University shared servers to cooperate in such projects, though you may elect to use a personally-owned device connected to the campus network so long as the quantity of data transmitted does not affect network performance adversely for the rest of the campus. Some departments may also give permission for their locally controlled computers to be used for such a purpose. Some cooperative projects, for example, the TOR project, carry the risk of the University participant's device’s being in violation of University policy because of the nature or content of network traffic passing through the device, particularly if it serves as an exit node. Those wishing to participate in such projects should be cautious for this reason and may be asked to withdraw from participation if a violation of University policies occurs. When possible, the eduroam service should be used for wireless network access. Temporary visitors with eduroam credentials from their home institutions are able with those credentials to use the University’s unrestricted campus services. Temporary visitors and members of the University community who use the visitor wireless service must comply with the University’s policies regarding network and Internet use. Abusive behaviors that disrupt campus service can result in a device being blocked indefinitely from further use of any University network services. When using Princeton University eduroam access from other eduroam-participating institutions, you must remember you are representing the University, and must refrain from activity that interferes with the host’s network performance or that brings opprobrium to the host school. At Princeton University, mass electronic mailings are permitted only as authorized by appropriate University offices. The same authority would govern e-mail to those constituencies, even if the sender does not use the official list, but creates multiple smaller groups to accomplish the same end. In general, the same authority approves the use of large e-mail lists as approves large paper mailings to the same audiences. You may not send large mass e-mailings or voice mailings without the appropriate University authorization. Appropriate authorization also must be obtained to conduct Web-based or e-mail surveys, whether among members of the campus community or of people outside the University. Surveys related to research and instruction must obtain approval from the University’s Institutional Review Board for Human Subjects, and, in the case of undergraduate research, from Office of Dean of the College. Special approval is not needed for departments seeking feedback on their courses or services, nor for recognized organizations canvassing their members. "Spamming" is spreading electronic messages or postings widely and without good purpose. "Bombing," sometimes known as "spamming" as well, is bombarding an individual, group, or system with numerous repeated messages. Both actions interfere with system and network performance and may be harassing to the victims, which in the case of newsgroups can number in the thousands. Both are violations of University regulations. Sometimes, people spam unintentionally. If e-mail is sent to a large list of people with all the addresses visible (rather than blind-copied or via a group list) and someone accidentally replies to "all," rather than just to the sender, the reply is copied to everyone on the list. Deliberate replies of this nature will be considered a violation of University regulations. You must refrain from unwarranted or excessive amounts of storage on central or departmental computing systems and servers, and from running grossly inefficient programs when efficient ones are available unless the responsible departmental authority has directed or approved such use for specific instructional or research applications. You must refrain from running servers or daemons without prior permission on shared systems you do not administer. You must be sensitive to special need for software and services available in only one location, and cede place to those whose work requires the special items. Those with disabilities requiring accommodation through specialized hardware, software, or other technology must have priority in the use of such items. If others are asked to cede access, they must do so. You must not prevent others from using shared resources by running unattended processes or placing signs on devices to "reserve" them without authorization. Your absence from a public computer or workstation should be no longer than warranted by a visit to the nearest restroom. A device unattended for more than fifteen minutes may be assumed to be available for use, and any process running on that device terminated. You must not lock a workstation or computer that is in a public facility. You must also be sensitive to performance effects of remote login to shared workstations. When there is a conflict, priority for use of the device must go to the person seated at the keyboard rather than to someone logged on remotely. Where the University has obtained very limited licenses for software, you must use only one share, not several concurrently. You must avoid tying up shared computing resources for excessive game playing or other trivial applications. Unnecessary printing is wasteful in cost and conflicts with the University’s sustainability goals. Members of the University community should practice thrifty and judicious printing. When a work is in progress, editing should take place online whenever possible rather than on a printed draft. Information that can be shared effectively electronically should not be printed at all. When it is necessary to print notes or reference material, consideration should be given to placing multiple pages on each sheet of paper and using two-sided (duplex) printing whenever possible. If someone without appropriate authorization removes paper or toner cartridges from departmental printers or copiers, or from computer clusters, to use for printing or copying elsewhere or for any other purpose, it will be considered a disciplinary matter. You must not attempt to intercept, capture, alter, or interfere in any way with information on local, campus, or global network pathways. This also means you may not run "sniffers" (programs used illegitimately to capture information being transmitted) on the campus network or any portion thereof. You may not operate Dynamic Host Configuration Protocol (DHCP) or Bootstrap Protocol (BootP) servers on the campus networks without authorization. Such a server may be connected to a private network within the Princeton.EDU domain, but only if the reply packets sent by the server are confined to the private network and do not enter the campus network at any time. You must assure that any device you plan to connect to the University network will be compatible both with the network and with the secure and effective operation of the network. Even devices like “smart lightbulb” controllers have the potential to interfere with normal network performance. You must not attempt to obtain system privileges to which you are not entitled, whether on Princeton University resources or on systems outside the University. Attempts to do so will be considered serious transgressions. Computer procedures, programs, websites and scripts that permit unauthenticated or unauthorized senders to send e-mail to arbitrary recipients from unrestricted sources are prohibited. You must refrain from any action that interferes with the supervisory or accounting functions of the systems or that is likely to have such effects. You must refrain from creating and/or implementing code intended, even periodically, to interrupt or interfere with networked systems or services. You must refrain from knowing propagation of computer viruses or presumed computer viruses. You must not conduct unauthorized port scans. You must not initiate nuisance or denial-of-service attacks, nor respond to these in kind. Wireless access points may not be installed by individuals in campus academic, administrative, or service buildings, including buildings rented or owned by the University off campus, without authorization from the responsible department. If authorization is provided, the individual must comply with any rules regarding the wireless access point established by the department. Computers, smart phones, and other network devices connected to the University's network are assigned an Internet Protocol (IP) address or, if mobile, "leased" an address by the University's network management servers. Using other than the assigned IP address can disrupt normal network operation for others, so users and owners of such devices are expected to refrain from supplying some other IP address for use in any network transaction. The University, including its faculty, staff, and students, must comply with local, state and federal law, including copyright law. Members of the University community may not knowingly assist others with use of the University’s information technology resources or Internet access to violate the law, including copyright law. Employees who are asked for such assistance must refuse. Members of the University community should report suspicion of crime involving, or revealed by, University technology resources (such as computers, mobile devices, network or Internet access, e-mail) consistent with the University’s “Policy on Reporting Illegal Activity” (www.princeton.edu/reportingillegalactivity). For suspected crimes in progress or where there is an imminent or serious threat to individual safety, Department of Public Safety should be contacted immediately. In all cases, employees must treat information regarding potentially unlawful activity with discretion and sensitivity to the privacy rights of others. There are actions which may not be specifically prohibited by law, but which are nonetheless dishonest. Rights, Rules, Responsibilities states: “Members of the University community are expected to be honest and straightforward in their official dealings with University processes, activities, and personnel. This obligation includes honoring contracts and agreements and providing accurate information on official forms and documents as well as to official University personnel, offices, and committees. Deliberate violations of this provision will be considered serious offenses; subsequent violations, or systematic violations in the first instance, will be considered extremely serious." Such actions also are unacceptable when conducted by means of the University information technology resources and Internet access. You must not create, alter, or delete any electronic information contained in or posted to any campus computer or affiliated network for fraudulent or deceptive purposes. Moreover, signing an electronic document (including e-mail), or posting to a Website, message board, or social network, or appearing as a virtual reality avatar, with someone else's name may be a violation of University rules especially if the person whose name you are using has not consented to your doing so. It also will be considered a violation of University rules if you use the University's electronic resources or Internet access to create, alter, or delete electronic information contained in or posted to any computer system on or outside the campus for which you are not authorized to do so. Unauthorized attempts to browse, access, solicit, copy, use, modify, or delete electronic documents, files, passwords, images, films, music, sounds, games or programs belonging to other people, whether at the University or elsewhere, will be considered serious violations. You must not use another's account-affiliated resource or personal computer or networked device without authorization. If you encounter an open session that exposes another's account-affiliated resource, close the session and try to notify the individual, whether within the Princeton.EDU domain or elsewhere on the Internet. It is considered a serious transgression to exploit the accidental exposure of another's account or to borrow or steal another’s identity. Without authorization, you must not attempt to listen to another person's voice message, or read another person's e-mail, or other electronic messages or files, even when these are accidentally exposed to your access. It is considered a very serious transgression to gain unauthorized access to another's account-affiliated resources or another’s personal device or workstation, e-mail, or files, through deliberate action. You must not attempt to fool others into revealing their log-in credentials or passwords, or passcodes, whether by social engineering, by tricking others into entering their credentials where keyloggers can capture the information, or by any other means. Log-in credentials (e.g., netids, user names, and passwords) are highly confidential. To obtain another’s log-in credentials without that person’s knowledge and consent is unacceptable. Any attempt to capture another person’s log-in credentials is a serious offense and may be subject to disciplinary sanctions. You must not create and send, or forward, electronic chain letters. To do so may also violate federal law, even if the chain letter assures the reader that it is not illegal and cite statutes as "proof." The redistribution of chain letters is a violation of University policy even when there is no mention of money in the letter. Some chain letters which appear genuine often are “urban legend” by the time they reach you; if you research the issue you may discover the cause existed long ago and the letter no longer is meaningful. You may not “borrow” an Internet Protocol address assigned to another person or entity, create a fraudulent IP addresses for a device you own or are using, or attempt to use with one device the IP address assigned to another you own or use. You may not operate a server that assigns, or attempts to control, IP addresses on the campus network. You may not falsify a hardware address for a device connecting to the campus network or a wireless interface used to connect a device to the University’s network. You should be aware that there are federal, state, and sometimes local laws that govern certain aspects of computer, broadcast video, and telecommunications use. Members of the University community are expected to respect the federal, state and local laws in using the campus technologies and University-provided network access, as well as to observe and respect University rules and regulations. Gambling is prohibited for employees in the workplace except as specifically noted in University policy 5.1.1 (www.princeton.edu/hr/policies/conditions/5.1/5.1.1/). This prohibition includes Internet gambling. Gambling is a closely regulated activity in New Jersey. For further information regarding New Jersey’s position on Internet gambling, see the website for New Jersey’s Division of Gaming Enforcement (www.nj.gov/oag/ge/internetgaming_faqs.html). The University’s policies concerning intellectual property are intended to further its central mission—the sustained production, preservation, and dissemination of knowledge—while exercising due care for its fiduciary responsibility for the resources it administers. The University and its community members are both holders and users of protected intellectual property. The University seeks to facilitate the responsible exchange of intellectual property and, to that end, works to raise awareness about issues of copyright, educating members of the community about principles of fair use, and providing resources to advance teaching and research. Whether you are an author or a user of copyrighted materials, it is important to understand the legal context for copyrights. They are created by law, and violations of the owner’s rights can be enforced through lawsuits. Even when the owner claims a violation has occurred, there are defenses and justifications for use of some copyrighted material. But it is crucial to start by considering whether the materials are protected by copyright – or not. Additional information about copyright can be found at the website provided by the Princeton University Library, the McGraw Center for Teaching & Learning, and the Office of the General Counsel, at www.princeton.edu/copyright. “Copyright” is one name for a bundle of rights, including the right to make copies, distribute copies, making derivative works, and the public performance and/or public display of works. Copyright protects original works of authorship, such as written works, paintings, sculptures, photographs, videos, recorded music, sheet music, computer programs, video games, architectural design, choreography, etc. Artists may also have moral rights to inclusion of the name of the artist on the work, and owners may have rights to prevent others from circumventing technological protections controlling access to the works. Copyright does not protect every idea or scrap of paper. It does not protect ideas, concepts, facts, data, titles, names, short phrases, procedures, or methods of operation. It also does not protect unoriginal works or works that are not fixed in a tangible medium (such as paper or digital code). The creator is ordinarily the owner of a work, but owners can transfer some or all of the rights to a work. In general, under University policies, faculty and students retain the rights to their works. However, works created by staff in the context of their employment by Princeton are owned by the University. The owner can choose to allow certain uses by the public, and may even donate the work to the public domain. Additional information can be found in the University’s Copyright Policy, at https://dof.princeton.edu/rules-and-procedures-faculty-princeton-university-and-other-provisions-concern-faculty/chapter-14. Princeton University encourages members of its community to make thoughtful, good-faith determinations that a use of copyrighted materials is a fair use in support of teaching and research, and to properly attribute those materials. When doing academic work, you are responsible for properly attributing all material--data, images, ideas, sounds, film, and verbatim text--that you find through any sources, including the Internet. The University's requirements and standards for the acknowledgment of sources in academic work, found in Rights, Rules, Responsibilities, apply to all electronic media. At a minimum, you should provide a citation for an electronic source that includes the source's URL, author or site manager's name (if available), and the creation or download date. If you want to use a copyrighted work, you should make a good faith effort to determine whether such use constitutes a “fair use” under copyright law or seek permission of the copyright-holder. As a general matter, you are free to establish links to Web pages. But you are not generally free to copy or redistribute the work of others publicly – even if you found it on the Internet – without authorization. Attribution does not resolve the issue of whether the use is permitted under copyright law. Note that many creators do not themselves own their copyrights - the copyright in most books is effectively owned by the publisher; the copyright in most music is owned by a distributor. However, by contacting the creator you may be able to obtain permission (www.princeton.edu/copyright/obtaining-permission), or the creator may be able to put you in touch with the rights holder. There are some collective licensing agencies that may be able to help you secure permission. The Library provides assistance in acquiring permissions for materials to be copied for library reserves, course materials, and other University-related purposes. Additional information about E-Reserves is available at library.princeton.edu/services/reserves/guidelines and also at www.princeton.edu/copyright. If your questions are not answered by University policies and websites, you can send an e-mail to copyright@princeton.edu. Members of the University community seeking permissions may not enter into agreements with vendors that would bind the University, unless the individual has proper authorization under the University Transaction Authority Policy. Many of the databases, electronic periodicals, and other publications that the University offers through its libraries are subject to license agreements with outside vendors that restrict your use of these resources. Similarly, many software products are licensed for the campus community by OIT and may not be used elsewhere or by other users. Before using such licensed resources, you will be given notice of any relevant restrictions and are responsible for complying with them. Your possession of copyrighted works – including music, video, games, etc. – does not necessarily grant permission to pass them on to others. You are responsible for determining the restrictions on music files, video files, podcasts, computer games, programs, packages, and data before copying them in any form or permitting them to be copied by others, using University resources. You may not circumvent copyright protection even on original media you own in order to make copies of the material. There is an important distinction between accessing content through the channels the owner makes available, whether buying a DVD or through a Netflix subscription, and downloading additional copies of that content from the Internet. Some people believe that, if they own a copy of a film or television show, they can then download a copy from the Internet without infringing copyright. However, unless such copying has been authorized by the owner or qualifies as a “fair use” under copyright law, the downloaded file is an infringing copy. It is your responsibility to restrict access to others' proprietary information that you may place online. For example, most popular peer-to-peer file-sharing software used to transfer music, film, video, and other files among users requires users to set certain protections explicitly. If someone fails to do so, anyone on the Internet can access without permission all files stored on the person's hard drive, and copyright infringement occurs. Note that peer-to-peer file-sharing applications can establish shared space and share files without the intent or knowledge of the less technologically sophisticated user. Although it is the responsibility of the user of such software to take proper precautions, it also is abusive to exploit the opportunity such a lapse may present. It also is a violation of copyright to allow unauthorized uploads of copyrighted material you may have downloaded legally, via Netflix or similar service. The entertainment industry in the United States has become quite vigilant in pursuing people who infringe copyright. The recording industry has established a website at www.whymusicmatters.com regarding legal and illegal sharing of music, and the Motion Picture Association of America has established a website related to film, television, and copyright at www.respectcopyrights.org. There is concern about copyright infringement as well among firms that produce software and computer games; literary agents regarding their clients' works; web designers; and photographers. A detailed resource for legal sources of online content is maintained by the non-profit higher education organization Educause, and can be found at legal sources of online content (www.educause.edu/legalcontent). As noted and defined in Rights, Rules, Responsibilities, for violations of University rules of conduct, members of the community are subject to several kinds of penalties. The applicability and exact nature of each penalty vary for faculty, students, professional staff, administrative and support staff, and other employees. Members of the University community who engage in any activity that infringes copyright-protected materials may be subject to disciplinary action. Under circumstances involving repeated instances of infringement through the use of the University’s computing network, network privileges may be terminated or suspended. For students, disciplinary action also may include any of the penalties outlined in Rights, Rules, Responsibilities. Also, if an individual has used services provided by the University on a fee basis, but chose to evade payment of the fee, a penalty normally will involve paying the fee. Penalties for copyright infringement include civil and criminal penalties. In general, anyone found liable for civil copyright infringement may be ordered to pay either actual damages or "statutory" damages affixed at not less than $750 and not more than $30,000 per work infringed. For "willful" infringement, a court may award up to $150,000 per work infringed. A court can, in its discretion, also assess costs and attorney's fees – meaning that a copyright infringer may be required to pay for the copyright holder’s lawyer. For details see Title 17, United States Code, Sections 504, 505. Even a first offense of willful copyright infringement (e.g., for commercial advantage or financial gain) can also result in criminal penalties, including imprisonment of up to five years and fines of up to $250,000 per offense. For details, see Title 17, United States Code, Section 506. The growth of the Internet has increased opportunities for exploitation. Each day, billions of e-mail messages “phishing” for personal and financial information traverse cyberspace. Despite all the warnings published by financial institutions and e-commerce enterprises and news coverage of such schemes, some people are fooled. For example, people at the University have seen e-mail messages designed to look as if they came from the Princeton University President. The OIT Information Security Office phish bowl posts alerts regarding phishing e-mail reported by members of the University community. For other tips on some of the dangers in cyberspace, see the Information Security web page (https://informationsecurity.princeton.edu/). If you are not sure whether a message is genuine, it is appropriate to check with a supervisor or other person in authority before responding or releasing information. It even may be appropriate to ask that the request for information be made in writing by mail or facsimile. The term "social engineering" refers to more than technology. A scammer with a convincing story might telephone an office worker or student and claim to work for a Help Desk at the University or at some financial institution, and ask the person for his or her account and password for some plausible-sounding security purpose. It is important to use critical thinking skills even for telephone or live approaches from people you do not know. Another type of danger is self-exposure. The availability of Facebook, Twitter, Instagram, and other “social networks” encourages people to let their metaphoric hair down and to express themselves in ways that, in retrospect, might be a little too open for comfort. Communications or postings in the online facebook of a University residential college are generally protected from the immediate view of the general public, while statements and images published on the Internet can typically be seen anywhere, can be copied by anyone, can last essentially forever, and can have serious unintended consequences. When creating public postings, tweets, or blogs, keep in mind the power of the World Wide Web to broadcast and preserve your statements. Any ill-considered postings may survive your commitment to them, and, because of the distributed nature of Web indexing, may be very difficult to expunge in the future. The University is committed to protecting members of the campus community from abusive actions by others both within and outside the institution. If you experience abusive incidents related to the technologies that you cannot pursue on your own, or if you are a supervisor who believes that an employee is abusing access to the information technology resources or Internet access, you should report the matter to the most appropriate contact. You also can report violations of privacy or property involving the technology, whether the perpetrator is a member of the campus community or not. Among the many offices and officials that work together to pursue cases of this sort are the Deans, Directors of Student Life, and Directors of Studies at the residential colleges, Office of Dean of Undergraduate Students, Office of Vice President for Campus Life, the Graduate School Office, Office of Dean of the Faculty, Office of Human Resources, Ombudsman, University Health Services Counseling Center and SHARE Program, Office of Information Technology, Department of Public Safety, Office of Institutional Equity and Diversity, Office of Communications, and Office of the General Counsel. The University’s “Policy on Reporting Potentially Illegal Activity” (www.princeton.edu/reportingillegalactivity) describes procedures for reporting, including the third-party-managed hotline for those who feel the circumstances warrant anonymity. If you do not feel your usual reporting path can work or are not sure of the appropriate division to handle the matter on your behalf, the OIT Support and Operations Center (the help desk people) will take your question and see that it is directed appropriately. OIT SOC staff can also help you identify sources of harassing or offensive communications from outside the University network. You also can report "spamming" and abusive or offensive communications to outside authorities, as most schools, corporations, and Internet service providers do not intend their electronic resources to be used for nefarious purposes. This section lists examples of acceptable behavior as well as behavior that may constitute a violation of University policy. The list is not all-inclusive; in addition, each situation must be considered in light of the specific facts and circumstances to determine if a violation has occurred. Acceptable behavior: A visiting relative is curious about Princeton's online services and Internet access. You demonstrate some of the facilities, and even let the visitor do some "hands-on" work, for example specifying some search terms for a World Wide Web search. You may also let the visitor check his or her own e-mail. But you are careful to retain control; you do not allow the visitor free rein, and do not allow the visitor to generate e-mail that will show a Princeton.EDU domain return address. Acceptable behavior: A supervisor explains that others in the department may need to continue work on a particular document during your planned absence, and, if no alternate practical means of ready access are available, asks that you provide the account password for access to the document. You do so. Acceptable behavior: A group of visiting scholars has arranged through Conference and Event Services to have University network access and netids during their stay on campus. Violation: You have a departmental computer account that provides access to certain shared files, to Princeton's general campus resources, to the Internet and World Wide Web. You do not use that account, and give the account and password to the director of a local community service agency, who uses it. Violation: You expose your networked device to misuse by leaving it connected but unattended (or otherwise unprotected) in a common area of your dorm room or, if an employee, in your office or work space, for an extended period of time. Acceptable behavior: While browsing the World Wide Web, you find a table of information and are impressed by the presentation. You view the source data, and make a note of some of the commands the author used to create that display. You use some of the same commands to create a similar table, containing information you want to present via World Wide Web. Acceptable behavior: You create a Web page, and include a link to someone else's Web page, with identification of that page. Acceptable behavior: You use a network sharing tool to download audio format music files for which you have obtained permission, or film or television files for which you have obtained permission, and you password-protect those files so no one without authorization can get them from your device. Acceptable behavior: You are testing beta-release software, and know it could fix a problem a colleague is experiencing. You contact the manufacturer, and get permission to share the upgrade with your colleague, who already has a legally obtained copy of the current production product. Violation: You have legally obtained an online copy of an audio format music file, or film or television show file. You have a network sharing tool empowered, which permits others around the world to upload copies of that file from your storage space, and you have put no protections in place to prevent uploading. Violation: Episodes of a favorite TV show are made Web-available for viewing only via a network streaming site that is authorized by the copyright holder. Since the rights-holder is allowing anyone to view the episodes, you make a copy of your favorite and allow others on the Internet to share your copy. Violation: You are asked by a computer manufacturer to participate in a beta test of a new operating system. You try it and it fixes many known problems. Without asking permission of the manufacturer, you put the software up on your server and create a tweet announcing that people may get a copy, free, at that location. Violation: You missed seeing a television show you like, and can't find a legal online source from which to view it, so you use a file-sharing tool like BitTorrent to find a copy on the Internet and download it so you can see it. Violation: You subscribe to Netflix, but find the transmission slow, so you download a film to view via BitTorrent or a similar file-sharing tool. Violation: You create an electronic copy of a new novel and put it online, so you and your friends at other schools or in other places can look at the same text at the same time. Violation: You bought a commercial disk of a recent film you like, but the disk was lost in an airport as you traveled. You later download another copy of the film from the Internet to replace the disk you lost. Acceptable behavior: You are alone in a campus computer cluster, and use the computer to initiate some favorite music to provide background noise while you work. However, when other people arrive to use the cluster, you stop the music. Acceptable behavior: You have an assignment that requires you to work with a collection of images some might find quite gruesome, and you need to use a computer in a campus cluster. You locate a machine that is situated in such a way as to protect others from inadvertently witnessing the images just by walking by. Violation: You live in the dorm; you and two friends are together, joking about a fourth person who seems to have a personal interest in you. You go into e-mail on your networked device, and create a sexually explicit message to the person with the apparent personal interest. You have no intention of sending the message, but one of your visitors hits the "send" key. Both you and the person who caused the message to be sent will be held responsible for the incident. Violation: You and a friend are visiting a classmate at his home far from campus, and find the classmate’s Gmail account open and active while the classmate is out of the room. You take the opportunity to look at the e-mail and images stored on the account, and to forward some of the most embarrassing to other Princetonians as if they came from the classmate. Violation: You create or display in the workplace, on a device that others could or may see, an image that might reasonably be found offensive or inappropriate within the context of the workplace. Violation: You change the system sound on residential college cluster computers to a potentially offensive or irritating noise. Violation: You digitize an intimate photograph and install it as the background image on the workstations in a departmental cluster. Violation: You e-mail, tweet or IM to others an image or joke that reasonably might be perceived by the recipient(s) as intimidating, hostile, threatening, or demeaning. Violation: Knowing that your start-up screen or background display for the device on your dormitory room desk might be considered offensive by some, you nonetheless seek in-person help from a computing support person or residential computing assistant without suppressing the display. Acceptable behavior: You are an officer in a recognized campus organization, and (with approval from the appropriate University authority) send e-mail to all the members of the organization regarding a coming event. Acceptable behavior: Someone "spams" you; you refrain from reply, but report the matter to the appropriate authority. Acceptable behavior: You want to post a follow-up to a social network item, but you notice the previous poster has posted that item to several dozen other locations as well. You send your posting only to the one intended location. Acceptable behavior: You create and/or run a script that accepts information from a web form and sends the information to a set single address or fixed set of recipient addresses. Violation: You create and/or run e-mail server software configured to accept e-mail messages from arbitrary senders and deliver to arbitrary recipients (an open relay). Violation: Someone has "spammed" several electronic mailing lists to which you subscribe, so you "get him back" by sending seven hundred identical derisive mail messages to the person's e-mail address. About retaliation: Retaliation in kind is not appropriate behavior, as it continues to victimize other people. There are appropriate avenues for protest, which will not violate University policy. See “Where to turn" in the section of this policy called "Protection for you." Acceptable behavior: Your recognized campus organization publishes Web pages. The group's home page contains this accurate information: "Membership in [name of group] requires payment of twenty dollars annual dues." Acceptable behavior: You use e-mail to apply for a grant that will help pay for your textbooks and travel. Acceptable behavior: You are a student seeking summer employment, and use e-mail to communicate with prospective employers. Acceptable behavior: You are about to graduate from Princeton, and use e-mail to communicate with potential employers. Acceptable behavior: You are a faculty member whose scholarly publication is carried by an online bookseller; you make the book title on your web page serve as a "hot link" to the point of sale. Violation: You are an officer in a recognized University organization that is supported by fees from members and "friends of" the organization. The organization has a WWW page explaining its activities. Rather than just state that support is by subscription from members and friends and stating factual information regarding fees, you post an appeal, "Send your dollars in now! Support this cause at Princeton." Violation: You contract with a commercial firm to include a banner ad on your Princeton University personal home page, so that you will get a small payment each time someone connects to the company's site from the banner-link on your web page. Violation: You are a University employee who manages a summer camp for children interested in chess. 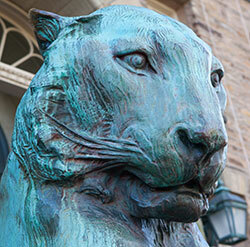 You use your Princeton University e-mail address and affiliation to advertise the camp. Violation: You run an advertisement of your own for-pay service on your web page. Violation: You use your networked device and assigned University IP address (Internet Protocol address) to register a domain and/or host a website or operate a mail-server with a .com designation. Violation: Without University authorization, you provide a mail exchange agent (i.e., e-mail service) for a .org domain on a device connected to the University network. Acceptable behavior: You use University equipment to record a debate between candidates for state office in order that a Politics class can view the video. Violation: You use your University access to post to a message board indicating that Princeton University supports a current candidate for political office.